Sword of Xolan by Alper Sarikaya is a hack and slash arcade platformer with all the stuff you love about those games. There is not much of a plot here, just Xolan armed taking out the bad guys by whatever means necessary. But really, the plot is secondary as the action and visuals take centerstage here. Like any good platform game, you will be swarmed by lot of monsters that spit poison, throw boulders and also spikes. Some of the monsters can fly, while others just come lunging towards you. Some of them will try to hit you from a distance. With your sword alone it will be difficult to fight off these monsters. Fortunately you can get spells to defeat them. To cast spells you’ll need to collect blue potions, each of which provides you with three spells to cast. It’s good to note that the potions are widely available, giving you an even chance of advancing in the game. This should entice casual gamers to keep playing. Sword of Xolan also has a nice set of controls that simplify play. There are five onscreen buttons, Cast Spell, Jump, Right, Left and Swing. You can move the controls around and they are very responsive to your taps. The controls are also complemented by the visuals graphics as they add to the game’s charm. The sound is also excellent and appropriate for an arcade style, throwback game like this. 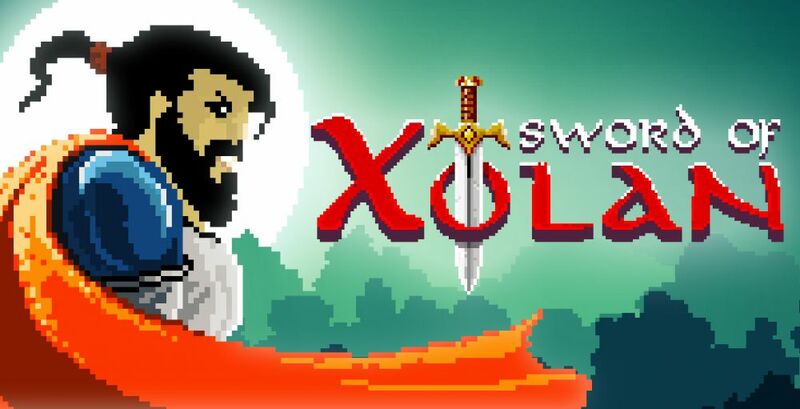 Sword of Xolan is available free on Android, while the iTunes version is a paid app.